Happy Summer Solstice!!! It's about ding dang TIME, Ma Nature!!!! Today's card was made for the Mod Squad Challenge, which just happens to be to use summer colors. How timely, Lee!!! You couldn't have chosen a better challenge for us! I will also enter it in the Simon Says Stamp Monday Challenge, anything goes, and the Simon Says Stamp Wednesday Challenge, to make a card for a friend. I am so in love with this stamp set. It's called Janie's Girlfriends, and it's by Hot Off the Press. Don'tcha just love these cute little gals? I colored them with my Copics, and added a little Glossy Accents to the jar of fireflies. Oh, I just LOVE summer, and love watching the fireflies at night. I so hope you are having a lovely weekend. I know I am. And, I'm gearing up to have our 2 grandsons here for a week. They LOVE to come "UP NORTH", and Grampa cultivates their knowledge of all things outdoors. They may even get to swim in Higgins Lake! Thanks for stopping by - see you soon! So happy to be posting a card today. They are coming few and far between these days. It must be summer!! (Insert happy dance here). 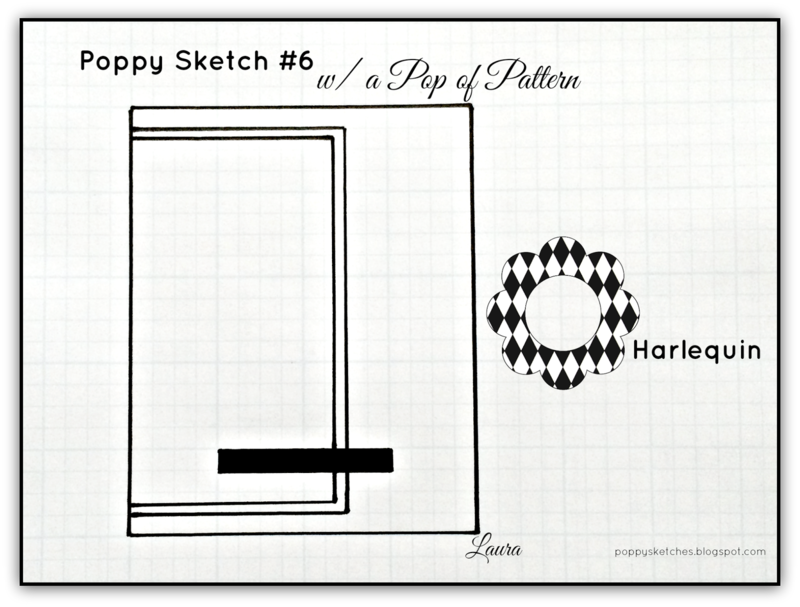 My card has been created for the Poppy Sketches Challenge. They provide the sketch and one other POP. This time it's to use the harlequin pattern somewhere on your card. I couldn't find any harlequin paper in my stash. Can you believe it? I have more designer paper than 5 people could use in 2 lifetimes. You would think there would be what I want - but NO!!! So I decided to make my own by scoring some ivory card stock and then stamping the butterfly and leaf images on it. I finished it off with some Liquid Pearls to accent the design. The butterfly has 3 layers, with the last one being out of vellum. Gina K Designs Jellybean Green Card Stock. Gina K Designs Ivory Card Stock. It's been raining quite a lot here. Hoping it will make our gardens pop. That's it for me, thanks for stopping by my friends. Another gorgeous day - how can we be so blessed. And here I am in my craft room instead of outside. Now that's TRUE addiction!! Today's card was made for the MIUM Challenge over at StampTV. We were charged with using the bleach technique. Now this is one of my all-time FAVORITE techniques, so it was a no brainer. This is a little 4x4 card, love making them! There are two ways to do the bleach technique. One is to use a paintbrush to paint the bleach on the image, the other is to use the bleach as an ink for your stamp. I like doing the inking thing, love the effect. The image I used for this card is one that I wasn't sure would work, because it's pretty detailed. But voile, it did. I even was able to stamp the greeting with the bleach too. That's it for me today. I may just have to go sit in the sun for awhile - thanks for stopping by!! Hope your weekend is grand. We have had absolutely STELLAR weather here. It's such a pleasure to look out the window and see green. The card I have for you today is for the Mod Squad Challenge. We are simply to make an anniversary card. It just so happened that our son Josh and our beautiful daughter-in-law Linda celebrated their 3rd anniversary this past week, so how opportune! This card is 5" square. I used one of my favorite stamp sets from Paptertrey Ink called Feather Finery. There is a companion die set that cuts the images out perfectly. Here I stamped with Versamark and heat embossed with gold on vellum. This stamp lends itself so well to this. Gina K Designs Pure Luxury Dark Chocolate Card Stock. So that's it for me. Thanks for stopping by, and I'll see ya later. Hope your Sunday is going well! I have 2 cards for you today. Both will be entered into the Mod Squad Challenge, which is to use red, white and blue on a card. The star card will also be entered into the Just Us Girls Challenge, which is to do the shaving cream technique. This was posted by my wonderful friend Sharyn. The vase of flowers card will also be entered into the StampTV MIUM Challenge, which is to make a card with at least 7 layers. The Mod Squad and MIUM Challenges have been posted by my dear friend Lee. For this card I did the shaving cream technique. If you would like to watch a video by Gina K doing this technique, click HERE. It's a little messy, but oh, so much fun!!! After I used the technique to color the background, I took a piece of GKD Pure Luxury White Card Stock and cut out the 3 stars using a star die. Then I layered that over the background paper, which had been adhered to the white card base. A little embellishment, and I'm done. I used a punch for the starbursts, and some Judy Dots and star stickers. Oh, and some little Enamel Accent dots for texture all over the card front. This card will be entered into the Mod Squad Challenge and the Just Us Girls Challenge. For this card I simply layered my patterned papers on top of some GKD Pure Luxury White Card Stock. I stamped the image on the white card stock with GKD Blue Denim Ink and paper pieced the vase. I think it has a real Asian flair, although I didn't start out to make it that way. This will be entered into the Mod Squad Challenge and the MIUM Challenge. So that's it for me today. It's been gorgeous here all week, but the mosquitoes are the size of dive bombers, and you can't stay outside very long. Hopefully they will die off with the hotter summer days. So nice to finally have the doors and windows open!! Thanks for stopping by my friends! !